London is home to many secrets. A couple of months ago, as some of you may know, I started up a second blog, unrelated to this one, called Love Letters To London. There, I can share my thoughts and views on every conceivable aspect of my favourite city. But those are very much based on reality and, as anyone with even a smattering of fondness for fiction will know, London is a popular destination for anything slightly strange to be going on. In Neil Gaiman’s Neverwhere, the tube network takes the station names literally; in Harry Potter there are magical buildings hidden all over the city; and in Doctor Who, every landmark is somehow linked to aliens. That’s just scratching the surface. 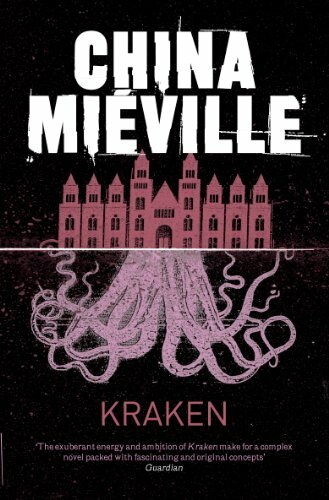 In Kraken, Miéville shows us another version. The book opens in the Natural History Museum, with curator Billy Harrow, expert on molluscs great and small, showing a tour group around the Darwin Centre, the back area of the museum that contains hundreds and thousands of pickled creatures; endless shelves of glass tanks containing preserved specimens of most of the planet’s species. The pride of the tour is the preserved, nine-metre giant squid, Architeuthis dux, one of the least understood animals on Earth. But this time, when Billy and his guests get to the central room, the squid, tank and all, has gone. With no sign of a break in, and the odds of someone sneaking out a tank of Formalin and squid nearly ten metres long without being noticed at absolute minimum, they are left with a quandry as to what has happened. The museum is closed for the day and the police are called in. And once the regular police have gone, a very specialised department move in, ones who deal with the stranger aspects of London. Confused, and after rejecting an offer of working with Baron and Collingswood, the strange police officers, Billy tells his friends Leon and Marge about what happened. Back at the museum a few days later though, Billy then finds a man picked in another jar, and before long that’s about the most normal thing that’s ever happened to him. Billy is dragged through the strange, unseen underbelly of the city where he meets two torturers-for-hire, Goss and Subby, a villainous tattoo, a cult of squid worshippers, the angels of memory that patrol the city’s museums, the striking union of magical familiars, and the Londonmancers, those who use the city’s magic for their own ends. Because it turns out there are a lot of cults and sects hidden in London, and all of them have just predicted the apocalypse. The world is about to end a hundred times over, but by finding the squid and restoring it to the museum, Billy might just be in with a chance of saving London and the world. I knew from experience that Miéville was going to be a dense slog, but I didn’t expect it quite like this. I always feel when I preface a review by saying it’s dense that it sounds like I’m being negative, but I’m really not. The novel is absolutely crammed with ideas I wish I’d come up with, from the idea of imprisoning someone in a tattoo (and then having them corrupt the innocent body they’re on), to Wati, a character who died and then crawled back through all the afterlives to the world of the living, but found he now had no body of his own, so instead inhabits London’s statues, figures, dolls and carvings. There’s the idea of how you can communicate using the city (speak into a post box, and the recipient gets the message in Morse code from their nearest streetlamp), and the fact that the city has antibodies, creatures made up of remnants of city life. But above all you have the angels of memory. Each museum has its own angel, made from things found within it (the Natural History Museum’s is a tank of formaldehyde with bones for limbs; the Sewing Machine Museum has a beast made of needles and bobbins) that protects the past from the present. It’s a wonderfully cute idea, although the angels are not strictly benevolent. And then there’s the stuff I can’t tell you because it’ll ruin some of the surprises. The plot jumps around a lot between numerous characters, and we see events unfold from many angles. It’s a fun ride, and part of the joy comes from never really being able to tell who is on who’s side; the lines of good and evil are blurred and alliances that would never normally be formed have had to come into play simply through necessity. The language is fun, the plot is complex but nonetheless works and very much holds together, and Billy is at least a likeable hero. There are lots of books out there about the mystical, hidden side of London, but you could do far worse than this one. Miéville is definitely an author worth checking out at least once – the new master of weird fiction.